These are the questions your text needs to answer for readers. Whether you are a writer or not, you can apply this same formula for success in your career, be it a job or a business. By “success”, I don’t mean money or power or titles. I mean happiness. The people you work with are critical to your happiness. You spend the majority of your time with people on the job. They might be your co-workers. They might be your employees. They might be a network of Skype buddies and Facebook Group colleagues. Focused on solutions, rather than on blame. Industrious and are never shy to carry their load. Obviously, you want to enjoy what you do. You might like designing fashion or decorating homes. You might like keeping track of numbers or fixing tech problems. You might like writing or singing or cooking or coordinating event logistics. You do get to choose what you do. You get to pick what you study. And even if you change your mind, we always hear about people who leave the world of business to do something more fulfilling, like teaching. Or who leave the world of teaching to do something more fulfilling, like preaching. That can make a big difference to your happiness. Some people love working from home; some people can’t stand it. Some people like to live very close to their office, others like a nice buffer zone. Some people choose to commute an hour each way, but long commuting times generally don’t make people happier. Think about where you work, and organize your life – and your job or business – to get the best out of your location. Most of us don’t think about this, and for most of us it makes very little difference. In certain careers the night shift or the evening shift makes a difference, and you might choose one shift over another based on how well you sleep at various hours and how many people you like working with. For some people, myself included, having the flexibility to work when I want and to be available at any time to attend to family matters is important. Working online for yourself might be the best option. Or you might not care. You might be fine with 24 hours on call – so why not go into real estate? Here is something that you might not have thought about. Why do you work? Well, yes, of course you need money to survive. But there are a million ways to make money. Why do you do what you do. It seems to me that most teachers, most non-profit employees, all clerics, most nurses and many other healthcare providers have chosen their careers as much for the outcomes as for the process. Not everyone asks that question, and I suppose that’s a good thing. If everybody asked that question, we’d have a world full of smart, healthy people and clean air and water, and we’d have nobody to sell us insurance and build smoke stacks. I think this is the most overlooked of the six letters: the H. It is the one that hits work-from-home entrepreneurs the hardest. Many people have that dream to work for themselves. A few people take that dream by the horns and make it happen. They work for themselves. And you know what they find? They find they are all by themselves. How you work is very important. Some people need noise and commotion around them; others need peace and quiet to concentrate. Some people need to work as part of a team, a collaborative effort; others need to be able to run with something. Some people need to lead; others need to follow. Some people need step-by-step instructions; others need goals and the go-ahead to reach them. Some people need hand-holding; others cannot stand someone looking over their shoulder. Some people need the indoors; others need the outdoors. Some careers can come with many Hows; you just have to choose the right workplace or the right business model to follow. In other cases, you might have to make a compromise. If you love the idea of being a game warden (the what), but can’t handle being always outdoors (the how), you’ll have to make a difficult decision. If you want to work for yourself and be the master of your own destiny, but you lose your motivation outside of a team environment, you’ll have to make a difficult decision. 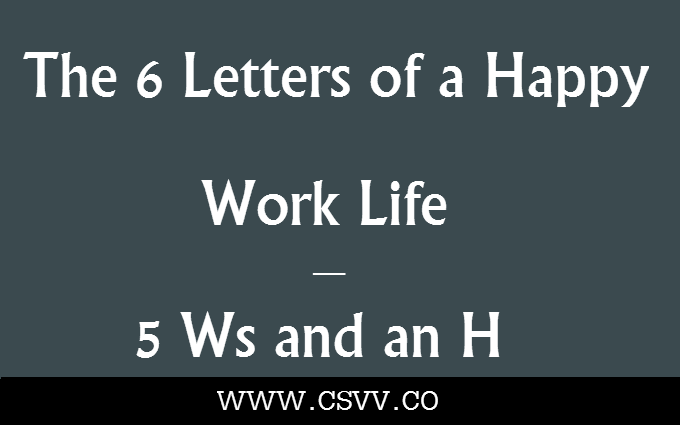 Understanding the 5 Ws and an H, is the first step to a happy work life. The second step is to understand what you need from each of them. Then, you can start to build a career or a business that gives you the most of what will make you happy.